GUNNISON, Colo. – “Tuffy” has been a godsend for many breast cancer patients in the Gunnison Valley. The RAM 1500 pickup was purchased a couple years ago by Cattlemen’s Days Tough Enough to Wear Pink to serve as transportation for those families that receive treatment outside Gunnison County. In addition to that, the vehicle is serving a larger role in professional rodeo. “We hope that this truck and this committee will inspire other committees around the world to do things to help those that are battling cancer,” said Andy Stewart, the voice of Cattlemen’s Days rodeo, which takes place July 12-14 in Gunnison. Just two weeks ago, members of the Cattlemen’s Days committee showcased “Tuffy” at the Guymon (Okla.) Pioneer Days Rodeo, where Stewart was announcing the event that has been inducted into the ProRodeo Hall of Fame. The pickup will return to the Elizabeth (Colo.) Stampede in a few weeks and has also been on display in Greeley, Colo., during the Fourth of July rodeo there. 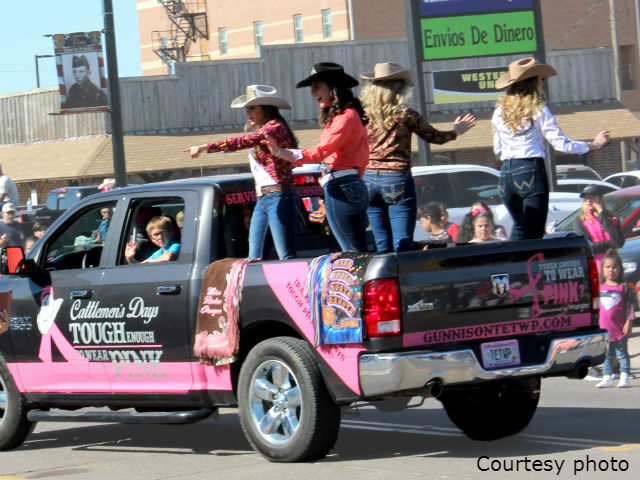 The Cattlemen’s Days Tough Enough to Wear Pink campaign has raised more than $2 million in its 13 years of existence. That money is used to provide all the needed services for breast cancer detection and cancer care in Gunnison. That’s imperative. Some patients still have to travel for specific services throughout Colorado. Having a reliable vehicle helps make those ventures more stress free. “One thing that is valuable to breast cancer patients in their area is transportation,” Stewart said. “Denver is 200 miles from the rural community, a farming and ranching community, and those that have to go to Denver for treatment may not have any transportation or maybe it’s not reliable or maybe the entire family uses one vehicle.